The " MASTER " hand-held refractometer series was selected by the Tokyo Trial Order Program 2009. 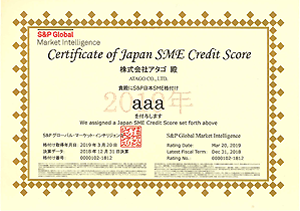 This program is sponsored by the Tokyo Metropolis Department of Labor and Industry, Commerce Division of New Business Support to experimentally purchase reputable and cutting-edge products released by local small and mid-size businesses in the last 5 years. Products selected receive marketing support by the Tokyo Metropolis and then are available for consideration for purchase by government agencies. The National Museum of Nature and Science has registered ATAGO products in the "History of Japanese Industrial Technology" database available on their Web site. The database introduces those products, facilities and equipment that contributed the development of the Japanese industries.